Discussion in 'Everything else' started by Chip, Jul 17, 2016. I dug up my PSP a couple days ago and was disappointed that the battery was pretty much shot. Not wanting to dish out for a proper Sony battery, and having had awful luck with chinese knockoffs, I decided to modify the case to accept a much bigger LiPo cell. Unfortunately, I didn't think to take pics along the way, so this isn't going to be a step-by-step tutorial or anything. This is what it looks like all put back together. Other than a small chunk I had to cut out of the UMD door, it looks pretty normal. Here's the big 3000mAH battery in place - original (knockoff) battery for scale. It's important to note that the capacity rating on this cell is likely accurate. The 2400mAH rating on the knockoff is an absurd exaggeration. LiPo energy density by volume is a constant. There's no way any stock-sized PSP battery could hold more than about 900mAH, regardless of what they print on the sticker. The big cell is just about the same height and thickness, but a full 3x as wide as the stock cell. This is the cell I bought, in case you want to try something similar. Moving the battery out of the way you can see that this "mod" really isn't all that complicated. Simply remove the UMD drive following any of the tutorials online, cut out the plastic partition between the UMD compartment and battery compartment using some dikes, and you've got a downright cavernous space to fill with lithium polymer goodness. Note that there is a lip on the UMD door that you'll have to shave off as well. That chunk missing from the door in the above pic is where a brace was located connected to that lip. The only moderately tricky bit is the battery PCB. You need this board to interface with the battery - I'm not sure if it's simply for charging/protection, or if there is some sort of DRM on board, but either way, it's necessary. This pic isn't mine, because I didn't think to take a pic before covering it with tape. In my battery, the red and black wires above were actually metal tape. 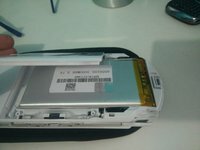 I carefully cut open the PSP battery case with a razor blade, cut the metal tape between the cell and the board, and removed the board. Then I unfolded the friction connectors, trimmed them down to simple metal strips, and soldered them to the battery terminals. With the board outputs safely connected, I carefully soldered the wires from the battery to the B+ and B- terminals. Everything was covered in electrical tape for safety, and assembled. There are two down sides to this mod. The obvious one is that you no longer have a UMD drive. This is no great loss, since PSP .CSOs can be played directly off the SD card. The other is that the battery life remaining estimate will be wildly inaccurate. The little icon will still be OK, but if your battery is 50% full, the PSP thinks it's 50% of a 900mAH cell, not 50% of a 3000mAH cell. In reality, a full charge from a cell this size should provide 10+ hours of hard gaming. I should probably point out that working with LiPo batteries - specifically soldering them - can be very dangerous. If you accidentally short it out, you can damage the battery, possibly to the point of bursting and starting a fire. Please do not attempt a mod like this unless you're good with a soldering iron. 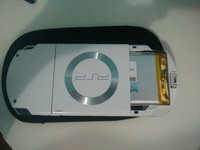 I just wonder why anyone would want to use a PSP nowadays J/K! Well, I would because PSP emulation is still pretty bad. Well, you can get a used PSP 1000 on ebay for less than $50, and it's actually a pretty decent emulation system. It struggles with SNES until you crank up the frameskip, but it's better than anything else in that price range. Plus, native PSX and PSP games. I have a PSP and a Vita and use them regularly, so I was only joking. Best use of the UMD disk tray I've ever seen. In that there isn't one anymore. better with snes games, equally as good with psx, PSP is obviously worse than native. ...and has a terrible input lag. 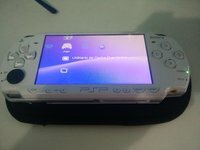 Xperia Play is a very cool device, I still use it. The problem is, the input lag makes it useless for twitch games like platformers. Don't know what's the situation on PSP though. I'm sorry, you're voicing your input when comparing two devices having not used one of the devices being compared? So you're sensitive to input lag, then you're going to lose your mind with the amount of frame skip just to play the same games on PSP. It was from an era where we just switched over from technically possible to sort of useful. The Xperia play is in the category of not quite perfect, and people nitpick things like input and audio lag. It's there I agree, but when apples to apples, I think most would chose the Xperia. You ever used a wiz or caanoo? I would arguably chose the Xperia over either of those and would place both above the PSP. The PSP was cool in its day, but between the overall performance, frame skips and whatnot, and the PITA of rooting or CFW to play emulators.... Ehh. Edit: it's fair to say the Xperia and Pandora are on competitive grounds, and where the Pandora wins is areas like lack of input and audio lag because the performance is similar. But I think you would be high if you said the PSP and Pandora are comparable. The only thing I did was to point out that Xperia Play, like any other Android device out there, has input lag. That's it. 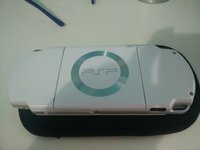 Not pretending that I'm a PSP guru or smth, just my 2 cents. Moreover, I thought my comment was vaguely useful because you didn't mention that. Ok, fair enough. There is a special brand of hater out there (they know who they are) that's been floating around for years. They like to rabble rabble whenever anyone suggests an android device has any merit over any other option. I incorrectly assumed you were one of them. I apologize. Hah, on the contrary, I think that Android devices have so much merit to them that they are still probably the best option for the average price-conscious, fiddle-hating retro gamers. I love my Xperia Play and Nv Shield, both devices hindered only by the input latency limitations of Android OS. And still probably good enough for most. No need to apologise my friend, I know people are jumpy these days. Hey, awesome to see you Chip! So do you have actual battery life numbers now ? Or you couldn't find the time to play long enough to empty it ? I've never managed to get it below ~30%, even with more than a week between charges. Granted I don't sit and play for hours upon hours at a time, but I would definitely say that 10hrs is a safe minimum estimate. 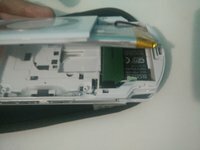 Below are some pictures of my MOD, where I did not I fixed the battery plate on the PSP I anenas placed so that the connectors fit together. Apparently the PSP system does not measure the level of baterya correctly, but I recorded the start time and end of each day I played and the total was quoted above. Special thanks to Chip friend who took many doubts and helped! Can someone show a enlarged picture or explain what and where to soder?